A-10 media day gets underway in Pittsburgh today and once again VCU is picked toward the top of the conference. The Rams check in at third in this year’s preseason poll behind Dayton and Rhode Island, the two teams that grabbed all of the available first-place votes. Mo Alie-Cox and JeQuan Lewis were VCU’s only two all-conference selections heading into this season, Alie-Cox landing a Second Team spot with Lewis cracking the Third Team list. 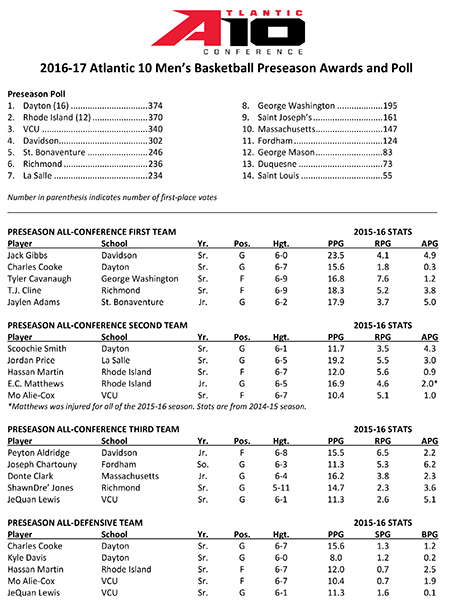 Both were Atlantic 10 All-Defensive Team selections along with Dayton’s Charles Cooke and Kyle Davis as well as Rhode Island big, Hassan Martin. VCU was picked to finish fifth in last season’s preseason rankings before tying both Dayton and St. Bonaventure for a share of the regular season title. The Rams then advanced to the conference tournament championship for the fourth consecutive season, falling to St. Joseph’s before moving on to the NCAA tournament where VCU would defeat Oregon State and lose a four-point decision to eventual Final 4 competitor, Oklahoma. What group of morons did they poll to come up with this? Guarantee VCU has players on the all conference first team at the end of the season. VCU will finish higher than 3rd in the conference. Media in love with Rhode Island for some reason. RHODE ISLAND HAS NOT BEEN TO THE NCAA TOURNAMENT SINCE 1999! 17 years! Rhody must have a great PR department.